Votizen, a new platform for connecting registered voters with elected officials, is launching the first-ever “virtual” precinct walk today, starting with San Franciscans for Jobs and Good Government, a committee supporting Ed Lee for Mayor of San Francisco. This virtual precinct walk is a modern update on traditional door-to-door campaigning, where previously, a politician’s supporters would walk through neighborhoods, knock on doors and encourage their fellow citizens to go out and vote. With Votizen, this process has finally been brought into the 21st century. It allows online volunteers to use social networking sites like Facebook and Twitter to send out personalized messages to their friends. These messages ask friends to commit to voting in an upcoming election. 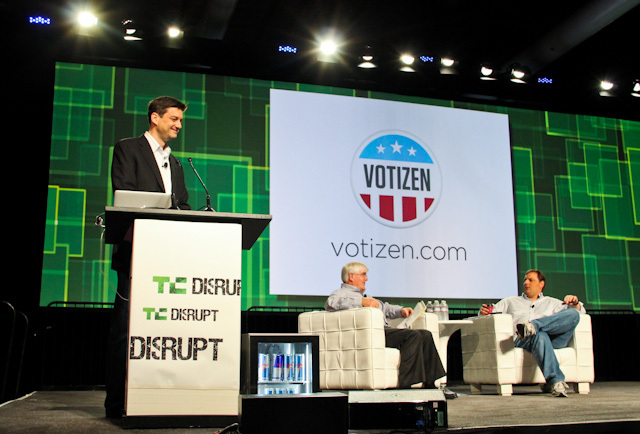 The promise of Votizen is one of using social media properties, and their vast databases of millions of users, to revolutionize grassroots campaigning. The revolution comes by not only by taking the campaigning online, but by leveraging the social connections between friends in the process. It also connects user accounts to voting databases in order to track whether those who promise to vote actually follow through. “The connection of the databases is the technological feature that wasn’t available before,” explains Ron Conway, Votizen investor and founder of San Franciscans for Jobs and Good Government. The critical mass of users – 400 million on Twitter and 750 million on Facebook, is nothing to sniff at, either. In addition, LinkedIn support is on the way and for technological laggards, a system for email authentication (often involving a follow up phone call), is available. The registration system may be a bit more cumbersome than other online sites, and that can hurt conversions to some extent, admits David Binetti, Votizen Co-Founder and CEO, but the end result is a database of authenticated, registered voters. Once a registered voter is confirmed on the service, they can then volunteer to be a “precinct captain.” In this role, the voter uses the service’s built-in social networking tools to reach out to their Facebook or Twitter friends, asking them to respond to a simple question: will you pledge to vote for (insert politician’s name here)? Friends can respond “yes” or “no.” And in this initial first run with the new technology, the candidate in question is San Francisco’s Ed Lee. When friends respond “yes” to a voting pledge request, Votizen then tracks whether or not that vote has actually occurred. The system encourages its users to vote by absentee ballot, so it can scrape records from the voter database, and then thank those who did, indeed, follow through on their commitment to vote. Those who did not are pinged again as a reminder. Beyond facilitating these social grassroots campaigns, Votizen users can also update their voter records, learn about the candidates and the issues and take a stand on those issues, writing letters to their representatives. By year-end, the platform will be up-and-running for local, state and national campaigns, including the presidential elections. Votizen, which received $1.5 million in funding back in December, has several big name supporters in the tech industry, both as investors and advocates alike. But will a campaigning mechanism of this nature disenfranchise those citizens who don’t have the same access to the Internet as others? Not for long. A later release will support a similar sort of campaigning, but uses SMS messages instead – a technology present even in the most basic phones. Those interested in joining Votizen can sign up to do so here. Below, an infographic depicting old political campaigning vs. the new.